CCleaner for Mac is an easy-to-use and reliable utility that will fix your slow boot times and optimize your system to make it run faster. Its features range from quick fixes such as cleaning internet browsing history to the much more complicated procedures of maintaining your privacy settings, cleaning unwanted software that bogs down your system and takes valuable hard drive space, and fully featured registry sweeps. 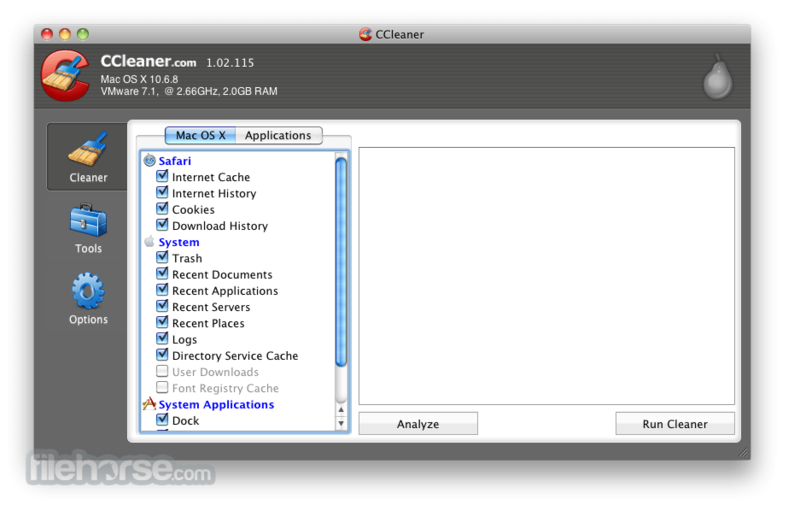 Download, Install or Update CCleaner for Mac! CCcleaner for Mac is free, small, effective, use very little system resources and off-course it does not contain any unwanted software such as Adware, viruses or spyware. cleaning of Safari binary cookies in Mac OS 10.7. Restore Default State option to cleaning rules. Note: Requires 64-bit processor. The demo version does not feature automatic browser cleaning, real-time monitoring, and automatic updating.